You can join by clicking here: Subscribe or the links on our website. 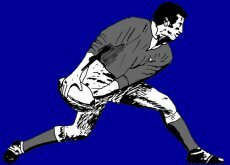 Why should I join the Rugby Memorabilia Society? The best reason I can give you is the opportunity to meet likeminded collectors (we have members from around the globe who collect items such as Programmes, Tickets, Trade Cards, Autographs, Groggs, Jerseys, books etc etc). We hold regular meetings with our AGM being the highlight of the year. Previous guest speakers have included former Internationals: Bleddyn Williams, Graham Price, Keith Jarrett, Bryn Meredith, John Pullin, Arthur Lewis, Russell Robins, Gareth Evans, Stuart Watkins, Allan Bateman, Terry Cobner to name but a few. We have also helped former Wales and British Lions forwards Allan Martin, Brian Price and Bryn Meredith to dispose of their remarkable collections of rugby memorabilia. On joining the RMS you will receive a Members Directory and a copy of the latest ‘Touchlines’ magazine. How do I meet other members? In South Wales and the South West of the U.K., there are social evenings, with talks or sales or swaps, every two months at various venues. The Members Directory is a crucial aid. Other areas are encouraged to meet in similar ways. There is an AGM, usually in June, on a Sunday, with Speaker, sales and fundraising Auction. We run occasional trips, too. What publications do you produce? A colour magazine ‘Touchlines’ produced every four months and, either by email or hard copy, a newsletter with auction sheet every two months, which are included in your membership costs. If it is of sufficient interest we will sometimes do so, usually via auction, and will charge you a percentage unless you are a Member. Where can I obtain rugby memorabilia? Then there are auctioneers who will hold specialist sporting memorabilia sales. Yes, every two months, plus specials and AGM, but you must be a member and most ordinary items are donations to help build funds. How much is........worth? Do you do valuations? If we have the expertise we will suggest a ball park figure but cannot of course guarantee you will get that price. Will you sell my collection? Probably only those items of real interest, and again for a percentage unless you are a member. We will however, for members, circulate the fact that you have items for sale and put you in touch with others who might want to buy. Do you want to buy my item...? Almost certainly not, as a Society: but a member might, and if you join we can ask, as in the answer above. Again, we may be able to express an informed view on inspection of photographic or face to face evidence, but would not usually guarantee that view. Have you anything relating to my old family member.....? For members, we can suggest where info or items might be found if such is known, and would ask all members for any assistance. Any questions please get in touch.